Ford was on top of its game when it came to performance back in the 1960s. It sniffed out the 2+2 pony car market that most automakers overlooked and dominated it with the Mustang during the mid 1960s. When it was time to inject serious performance into the Mustang, Ford tasked the right man – Carroll Shelby to do the job, the end result was the GT350 and GT500 Mustang models. It was also Shelby’s 2-seat AC Cobra 289 and 427 models that brought super car performance to Ford’s new car lineup in the 1960s. The full-size Galaxy 500 and XL when equipped with Ford’s legendary FE big-block V8 were both doing battle very well with its rivals. Ford seemed to have the racing image and the styling that performance oriented buyers wanted. However there was one big gapping hole in Ford’s lineup. It didn’t have a flashy mid-sized muscle car to compete with the Pontiac GTO which had been released in 1964 to much fanfare. The 1964-1965 Fairlane didn’t have the flashy looks and lacked real punch under the hood. For 1964-1965 the 271 horsepower K-code 289 cubic-inch V8 was as good as it got. 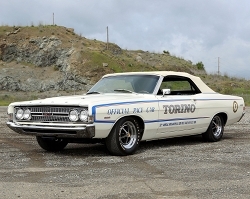 The only exception was the 1964 Ford Thunderbolt (a ultra high performance Fairlane) which was a very limited production drag race car that Ford built for racers which was equipped with a 427 CID V8, factory rated at 425 gross horsepower (some estimates have the true horsepower as high as 600). Never-the-less, if you weren’t a racer you weren’t getting this type of performance. and a few 390 V8s were also available on both the Fairlane GT and GTA – the most powerful of these was a 320 horsepower 4-barrel 390 V8. The good news was 410 and 425 horsepower versions of the FE 427 cubic-inch V8 were optional on the Fairlane but the takers were few, so not many were so equipped. Ford really didn’t buckle down and offer a muscle car that embodied both a sleek body style and plenty of large displacement V8 power until 1968. For 1968, the Fairlane GT and GTA were gone, but an all-new Torino GT was now ready to do series battle – the Torino for 1968 was the new upscale mid-size offering from Ford. The Fairlane would remain for a few more model years. For the 1968 Torino GT, not only was the styling sleek and long but the roofline was now a genuine fastback. Part of the reason for this new styling was Ford wanting to win in the NASCAR racing circuit. These sleek lines especially the fastback roofline offered less aerodynamic drag than many of its competitors. For the Torino GT buyer this meant obtaining styling that was better than the average muscle car. The Torino GT was available in three body styles – the (fastback) SportsRoof, (formal roofline) coupe, and a convertible model, however it was the SportsRoof that stole the show with 74,135 produced for 1968. This was almost four times the production output of the 1967 Fairlane GT and GTA which topped out at 20,787 total units. Even the production output of the 1968 Torino GT with the formal roof at 23,939 units was more than total 1967 Fairlane GT and GTA production. Additionally if you add up the 5,310 Torino GT convertibles produced and the total output of the coupe and SportsRoof you have 103,384 1968 Torino GTs produced. Now compare that to the total production of the 1968 Pontiac GTO which was 87,684 units, and you see real quick how the Torino GT had usurped in sales, the muscle car favorite. This was no small feat. The Torino GT was a real looker with four horizontal round headlamps – two on each side of the front end. A very long front hood was also part of the styling along with a set of very attractive rear taillights which looked very similar to the ones found on the full-size 1968 Ford Galaxie. Overall the Torino GT screamed speed. There was one problem, where the 1968 Pontiac GTO provided a 400 cubic-inch V8 to all buyers, the Torino GT offered as standard a 200 horsepower 2-bbl 302 cubic-inch V8. It had, a low for the time, compression ratio of 9.0:1. Optional was the “Thunderbird V8” which was Ford’s lingo that year for the 265 horsepower 390 V8 which was equipped with a 2-barrel carburetor and had a 9.5:1 compression ratio. The 2-barrel 302 and 2-barrel 390 were not bad motors but they were geared to the crowd who liked the operation of the smooth and efficient motors found in pedestrian 4-door sedans. Fortunately the “Thunderbird Special V8” was also available for the Torino GT. The Thunderbird Special was a (S-code) 325 horsepower 4-barrel 390 V8 with a 10.5:1 compression ratio and it was standard with dual exhausts. Unfortunately the Thunderbird Special 4-barrel 390 V8 looked better on paper than in execution. One could expect a quarter mile time in the 15 second quarter mile range. Car Life magazine back in day obtained a 15.8 second quarter mile time at 90 mph with a 3.25 rear axle and a 3-speed automatic. Car Life also obtained a 0-60 mph time of 7.7 seconds, not bad for a muscle car but nothing worth bragging about. Ford did offer early in the model year the “Cobra 427 V8” which was rated at 390 gross horsepower but could only be equipped with a 3-speed automatic transmission. So far with the elapse of 44 years, there has not been one 1968 Torino GT equipped with the Cobra 427 V8 which has surfaced. So it’s unlikely that one was ever produced even though the 427 option was listed clearly in the 1968 Ford Torino sales brochure. However the good news was Ford had a trick up its sleeve called the Cobra Jet (CJ) 428 cubic-inch V8 – a new high performance FE big-block. 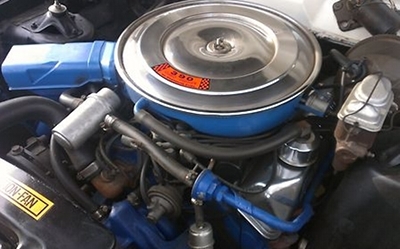 This engine which had a midyear debut in the 1968 Mustang also became available in the 1968 Torino GT as a mid-year option replacing the 427. The 428 was rated at 335 gross horsepower, on paper just 10 horsepower more than the 390. But hey, who was Ford kidding the CJ 428 V8, packed a lot more punch – real horsepower was closer to 400. The quarter mile dropped by an average of a second when the CJ 428 was ordered versus the 325 horsepower 390. A very low around 14 second quarter mile time at close to 100 mph was obtainable with the CJ 428. Unfortunately in this first year of the CJ, it could not be equipped with the ram-air induction package in the Torino GT. Dual exhausts were standard with the CJ 428 just like the S-code 390. As an odd twist of history, the 195 horsepower 2-barrel 289 cubic-inch V8 replaced the 302 as the Torino GT’s base motor towards the end of the 1968 model year. The change was due to an United Auto Workers (UAW) strike that put the pinch on Ford for a few weeks. For the Torino GT, a (Synchro-Smooth Drive) 3-speed manual was standard. A 4-speed manual and a Cruise-O-Matic Drive 3-speed automatic transmission were both optional. Ford did implement forward thinking with the Torino GT. Unlike many muscle cars back in the day that only possessed straight line performance, the Torino GT was a well-balanced performance car. It had handling to match its acceleration. The Torino GT SportsRoof weighed in at 3362 lbs and the Torino GT coupe weighed in at 3348 lbs – both of which were light enough to be very nimble in the turns. With the touring type suspension of the GT, the SportsRoof and coupe handled the tight turns and corners very well for the era. However with the convertible, handling suffered both from its more hefty 3,506-lb curb weight and the loss of structural integrity due to the missing steel roof. Worth noting, when it came to handling the 302 and 289 equipped Torino GTs really shined, since both were small-block V8s which weighed considerably less than the 390 and 428 FE big-blocks. Less weight over the front wheels, allowed the Torino GT to handle better in the turns. Braking also improved for 1968, with the Torino GT having a new dual master cylinder braking system with 10-inch grooved drums which provided excellent cooling. 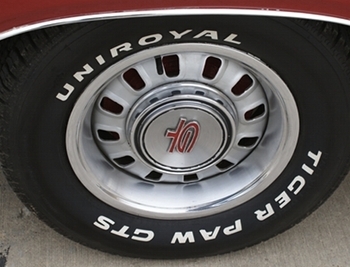 Stopping along with handling were aided by a standard set of 14-inch Wide Oval performance tires. Nowhere was the improvement over the previous year Fairlane GT more apparent than in the Torino GT’s futuristic interior. The Fairlane GT had been stuck with a fleet car interior with a dash layout that was about as exciting as an episode of the TV show Hazel. 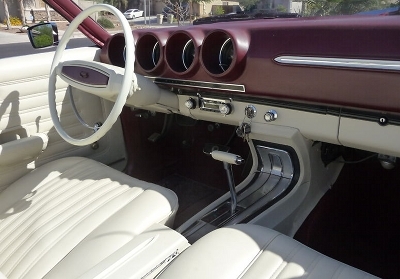 The Torino GT dash layout consisted of round gauges that were imbedded in a stylish dash pad. And when it came to other parts of the interior there were numerous options which even included a sleek looking center console. The same was true with the seating surfaces where there was a wide array of different styles and materials available. When equipped with many options the Torino GT now rivaled in terms of luxury and comfort a loaded LTD which was Ford’s flagship car at the time. There’s no doubt that 1968 was the year that Ford finally got serious about competing in the mid-size muscle car segment. Unfortunately the Torino GT would only last a few more model years due to the muscle car segment bubble bursting, however a sporty Torino would remain a staple in Ford’s lineup until the close of the 1976 model year. Had it not been for the Corporate Average Fuel Economy (CAFE) standards, the Torino would have lived on for many more years. Even when Ford pulled the plug on the Torino, the 1976 Torino from the very popular Starsky and Hutch TV show was one of the most popular cars on TV. Ford had a popular ad slogan back in 1968 called “Better Ideas”, and the 1968 Torino GT was in fact one of its better ideas put into practice.